The above is an old picture of the Parsi towers of silence in Bombay (now Mumbai), India. You can tell it's an old photo by the number of vultures... Living there in the '70's and '80's you could always see a very large number of vultures riding the thermals. However, during the '90's the vulture population declined by over 95%. Scientist and ornithologists looking into this found that the cause of this die-off was the drug diclofenac. Cheap diclofenac was widely used across the Indian subcontinent as a pain reliever for livestock. If the livestock died and were eaten by vultures (which was very likely, as vultures were the main "cleaners" of carrion) the diclofenac then caused renal failure in the vultures, leading to their deaths. Without the vultures to clean up, the carcasses of dead animals are left to rot, and the population of wild dogs has skyrocketed. "... A research programme led by Anil Markandya of the University of Bath, UK, has calculated that the decline of vultures made way for at least 5.5 million extra feral dogs in India between 1992 and 2006. During this period, these extra dogs would have been responsible for at least 38.5 million bites. National surveys show that in India 123 people die of rabies per 100,000 dog bites, suggesting that a minimum of 47,300 people may have died as a result of the vulture die-off. Taking account of the cost of treating bite victims and dealing with the extra deaths, the researchers calculate that the use of Diclofenac has indirectly cost India an unforeseen 34 BILLION US Dollars in extra health costs ..."
Additionally, this has played havoc with the way Parsis dispose of their dead. "...The Zoroastrian system for disposal of dead bodies is ... based on the principle that the elements, fire, water, and earth must never be defiled and be maintained pure. It is thus enjoined that after death, the body of the person must be disposed of in such a manner as not to defile the elements or to injure the living. Large voracious birds like vultures would eat the flesh and sinews, leaving only the skeleton. The bones remained exposed for a year until they became quite dry. They were then buried as “bone meal manure” in fields; no tombs were permitted on the spot. The distinguishing features of the system are: Speedy disposal of the fleshy parts. It takes about 25 minutes for the birds to finish the corpse, It is economical in the sense that disposal by birds costs nothing and is free, It has the element of charity in offering food to hungry birds, and it displays the ideal of equality. The remains of the rich and the poor lie side by side... 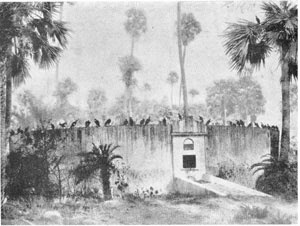 In keeping with this ancient custom, the Parsis of India erected enclosures known as Towers of Silence, within which the bodies of the dead are disposed of in accordance with stipulated procedures. In the Towers, vultures come and eat the flesh ..." The dying off of the vultures has seriously disrupted this custom, and other scientific methods are being tried to maintain the custom e.g. using solar reflectors to speed decomposition, using ozone-generators to fight the smell, etc. Plans are also afoot to breed vultures in captivity for this purpose.